Fits 2005 to 2018 Dodge Challenger (may require modifications). This item has FCA US factory OEM design and performance built into it. No drilling required and installs in just a few minutes. Fits 2006 to 2008 Dodge Magnum. BLACK THROTTLE CABLE / BRACKET & SPRINGS COMBO. PEDAL IS UNIVERSAL AND CAN MOUNT AT ANY ANGLE. BILLET FLOOR MOUNT ALUMINUM GAS PEDAL /. PEDAL IS UNIVERSAL (MOUNTS TO THE FLOOR OF ANY VEHICLE). PEDAL IS UNIVERSAL AND CAN MOUNT AT ANY ANGLE. BLACK THROTTLE CABLE / BRACKET & SPRINGS COMBO. MADE FROM 6061 BILLET ALUMINUM /. NEW GENUINE HONDA / ACURA BRAKE PEDAL PAD FOR VEHICLES WITH AUTOMATIC TRANSMISSION. THIS WILL NOT FIT VEHICLES THAT HAVE A CLUTCH PEDAL. FITS THE MODELS AND YEARS LISTED BELOW WITH AUTOMATIC TRANSMISSION ONLY. 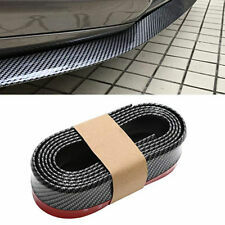 Universal 2.5M Car Front Bumper Lip Body Spoiler Chin Skirt Protector Black. There are NO EXCEPTIONS! United State ! Best regards. Brake Pad Cover Size: approx.130 85mm. Accelerator Pad Cover Size: approx.150 80mm. 1pc brake pedal. Weight: approx.195g. 36" THROTTLE CABLE WITH BLACK SLEEVE. NOTE BRACKET INCLUDES DUAL SPRINGS . BRACKET IS MOUNTED TO DRIVERS SIDE. ONE (1) 36" STAINLESS CABLE. CABLE AND HOUSING CAN BE CUT TO FIT MOST APPLICATIONS. OEM Select Parts. We are happy to assist in filing a warranty claim with the manufacturer in the event that a part fails after installation. Most manufacturer's warranties are valid for 12 months/12,000 miles. Price is for two pads.1988 thru 1990 Rangers have the smaller pedal pads. Fits Ford Explorers and Mazda's B2500 thru B4000's from 94-07 that have a stick ! 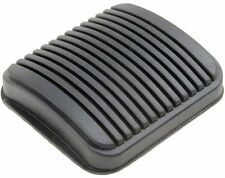 ® Heavy Duty Brake Pedal Cover Pad. 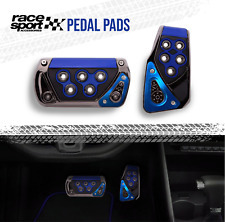 ® heavy duty Brake Pedal Cover Pad, designed tough and made from the highest quality materials. Fits several Fits Toyota vehicles (check application chart above)AUTOMATIC TRANSMISSION ONLY! For Manual Transmission Stick shift 3 pcs. Durable & Rustproof. Replace them with our great product, introducing the V-Liteway floor mats ONLY for 15-18 F-150. We use 3D scanning and put all the data into computer for a product with even prettier result. You can't beat all these with this price. 1985-1995 Toyota MR2. 1980-1999 Toyota Tercel. 1975-2008 Toyota Corolla. Toyota OEM Automatic Brake Pad. Toyota factory warranty. 2003-2008 Toyota Matrix. 1992-1999 Toyota Paseo. We will work with you to resolve the problem. Angle is adjustable with set screw. This is easily mounted on your firewall. 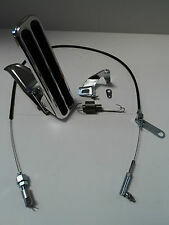 This kit also includes a new 24" stainless throttle cable with black housing. This throttle cable is 36" while the Housing is 24" in length, but both can be cut to your desired length. Brake / Clutch Pedal Pad. 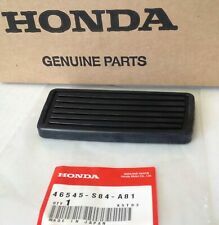 GENUINE FACTORY OEM Brake/ Clutch Pedal Pad FOR HONDA & ACURA. Honda & Acura. GENUINE FACTORY OEM. 100% FACTORY ORIGINAL OEM PART! We make every effort to represent what these parts are and what vehicles they fit. Your faithful Honda's brake lights not shutting off?. Clutch safety switch acting sketchy?. 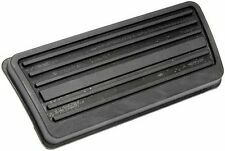 46505-SA5-000 Stopper Pad (1) JPN / THA / PHL. Treat your faithful Honda to the very best - and - keep you Honda 100% Honda! 1x Set Car Foot Pedal(2 Pcs). Seven words clip attached to the original of the pedal car fixed, need not drilling, convenient installation, most models applicable. Non-slip surface design, safe for driving and reduce foot fatigue. 2002-2006 Acura NSX. All Year Honda S2000. 1993-1997 Honda Del Sol. 1984-2005 Honda Civic. Universal Fit For Honda /Acura Vehicles With Manual Transmission. 2007-2011 Honda Fit. Color: Polished. 2002-2006 Acura RSX. 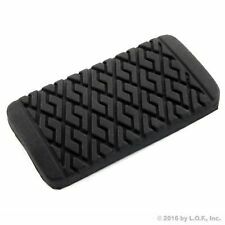 One Genuine OEM New Brake Pedal Pad Rubber Cover. RSX 2002-2006. TSX 2004-2014. ZDX 2010-2013. TL 2000-2014. MDX 2001-2013. RDX 2007-2012. RL 2005-2012. 2004-2009 Prius. 2004-2007 Highlander. Genuine Toyota E-Brake Pedal Pad. 2005-2015 Tacoma. We have All Toyota And Scion Parts. MANHATTAN BEACH TOYOTA. 1987-2006 Wrangler TJ LJ. 1987-2001 Cherokee XJ. GAS PEDAL MOUNTS OVER THE TOP OF EXISTING PEDAL USING THE BRACKETS AND HARDWARE PROVIDED IN A CROSS PATTERN (BRACKETS ARE MOUNTED DIAGONALLY ACROSS EACH OTHER). HARDWARE INCLUDED AS PICTURED. THIS IS A UNIVERSAL APPLICATION (CHEVY, FORD & MOPAR CARS AND TRUCKS). New Set of Netami Two Toned Anodized Red and Black Pedal Pads for Automatic Vehicles (2 pc. Set : Gas Brake). 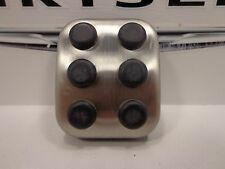 - Lightweight High Quality Machined Aluminum Pedal Pads. - Unique Anodized 2 Tone Red and Black Finish with Machined Holes. Fit's Truck and Suv's. (Automatic Transmission). Strong Die-Cast Aluminum. 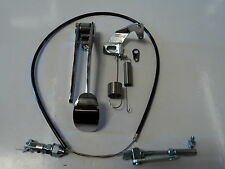 Diamond Truck Pedal Set by Pilot. Throttle cable with braided stainless steel housing. Plus, we have access to thousands of parts that are not listed. This kit includes a new 24". 1958-1971 GM Accelerator Pedal. 1964-1967 Special, Skylark, GS. 1964-1967 Chevelle, El Camino;. 1964-1967 Cutlass, 442, F85. 1970-1971 Camaro with Floor Mounted Pedal. 1958-1967 Impala;. Another Quality Reproduction ByCARS. Vehicle ergonomics are typically designed to accommodate all drivers from the very tall to very short, which may compromise the seating position of most drivers. If you find yourself in that situation, pick up a high-quality solution by ordering this all-new ACCELATEC PCS68 Clutch Pedal Extension for your 1994-2019 Mustang. Clamp Over The Origin Pedal, Enlarge The Area. 1 x Foot rest Pedal. Safety For Driving and Reduce Foot Fatigue. Perfect For Auto Transmission Car With Non-Slip Surface. Bring Unique Apprearance for Your Plain Factory Pedals. Pair (2) of high-quality reproduction pedal pads. Compatible for : 2013 - 2017 ram 1500 crew cab. Compatible for : 2013 - 2017 ram 2500 crew cab. Compatible for : 2013 - 2017 ram 3500 crew cab. Compatible for : 2013 - 2017 ram 4500 crew cab. Compatible for : 2013 - 2017 ram 5500 crew cab. 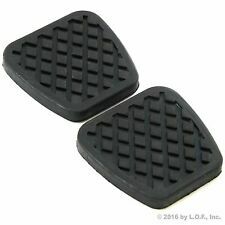 Genuine Toyota / Lexus Clutch / Brake Pedal Pad Set of 2. Toyota Part Number 31321-14020 X2. We have All Toyota And Scion Parts. (To 48 States Continental US Only). Pictures Are For Sample only. -Celica 1982-1999 (Manual Transmission Only). Brake Pedal Pad. GENUINE FACTORY OEM Brake Pedal Pad FOR HONDACIVIC. Honda CIVIC. CIVIC ( A/T Automatic Transmission Vehicles). 1984 - 2000 HONDA. GENUINE FACTORY OEM. We make every effort to represent what these parts are and what vehicles they fit. NEW GENUINE TOYOTA BRAKE PEDAL PAD FOR AUTOMATIC TRANSMISSION TOYOTAS. 1995-2001 TACOMA. 1979-1995 PICKUP TRUCK. POLISHED ALUMINUM GAS PEDAL. UNIVERSAL PEDAL WITH SPLINE FOR ANY ANGLE. Update your vehicle with new pedals and brake pads. Having the right parts makes for a smoother drive. And making sure your brake pads are changed regularly will keep you safe as well. How do you choose the right brake pads? If you are buying your own brake pads, it's important to gain as much as knowledge about the part as you can. You want to make sure you have the ideal fit for your vehicle to ensure safety. You also want to make sure you do not have to replace them more often than necessary. Consider your typical driving habits and what kind of wear and tear to be prepared for because you can choose between organic, semi-metallic, fully metallic, and ceramic brake pad materials. For regular driving, semi-metallic materials cover most types of terrain and accommodates the typical driver. If you regularly do any heavy pulling or any other heavy-duty tasks, higher-end pads, such as ceramic or fully metallic, are a much better option. How do you change car pedals? To change your pedals, follow these simple steps. You can use any pedal set of your choice but make sure the pedals are designed to fit the make and model of your car. Reach behind the pedal and take off the existing cover by pulling the rubber up and over the metal plate underneath. Use a degreaser to thoroughly clean the metal plate. Place your new pedals on the bare metal plates, making sure they are securely fastened. How do you clean your car pedals? Follow these simple steps to clean your car or truck pedals. You can use an all-purpose cleaner or cleaners specifically made for cleaning the interior of vehicles. This is something you can do while cleaning the rest of the interior of your car. Put a towel down underneath and behind the pedals to absorb runoff or dripping any particles. Use a cleaner with a detailing brush to scrub out and remove embedded dirt and any particles. Wash any remaining soap and dirt with clean water. Use a towel to wipe off any remaining residue. How do you know when to change your brake pads? Look for wear by viewing your brake pads through the spaces between the wheel spokes. The outside pad will be resting up against a metal rotor. The pad is still good if you can see 1/4 inch of brake pad. If there is less than 1/4 inch of pad, you know your car is ready for brake pad replacement.